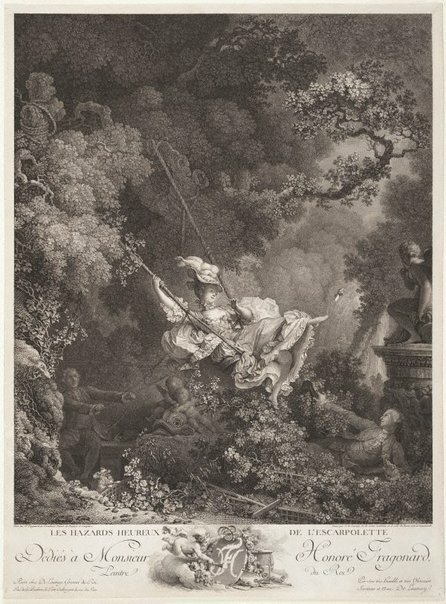 The engraving by Nicolas de Launay after Fragonard’s ‘Swing’ reproduces (in reverse to the painting in the Wallace Collection London) one of the iconic images of 18th-century art, epitomizing the artifice and light-hearted eroticism of the late Rococo style. The main difference between the painting and engraving is the addition of plumes in the hat of the girl. De Launay published the print himself, advertising it in the ‘Gazette de France’ on 2 April 1782. He dedicated it personally to Fragonard, calling himself Fragonard’s “very humble and very obedient servant”. Other inscriptions below the image specify the title, the painter, the engraver and the address of De Launay as the publisher. The lively vignette below the image bearing Fragonard’s initials was designed by Pierre-Philippe Choffard. Prints & drawings Europe 1500-1900 , Sydney, 2014, col illus p 91.